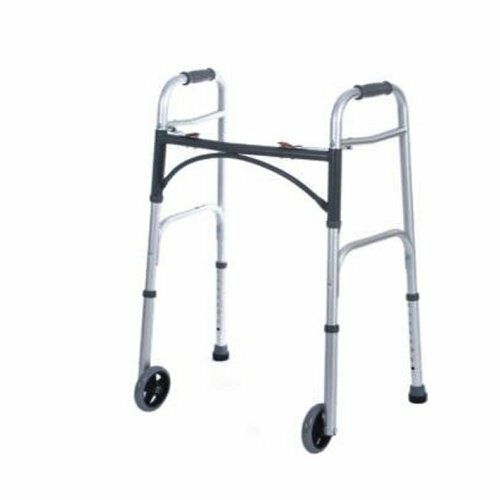 Medtherapies Deluxe Folding Walker w/Wheels (Adult 5 by Medtherapies Braces at Get Cheap Health Insurance. MPN: 10210-4. Hurry! Limited time offer. Offer valid only while supplies last. Geometric design eliminates side frame wobbling. Angled front legs enhance stability. Dual side braces. Fold flat for storage. Grabber tips included. Geometric design eliminates side frame wobbling. Angled front legs enhance stability. Dual side braces. Fold flat for storage. Grabber tips included. Easy push-button mechanisms may be operated by fingers, palms or side of hand. Sturdy, 1" diameter anodized aluminum ensures maximum strength, while remaining lightweight. Each side operates independently to allow easy movement through narrow spaces. Unique U-shape frame design creates greater clearance. 5" or 3" wheels available. 5" available for junior only. Adult Adjusts 32"-39"H. 23"Wx18"D (open). Folded 4"D. 350 lb capacity. Weight 7 lbs, 12 oz. Youth size walker also availableAdjusts 25"-32"H. 23"Wx18"D (open). Folded 4¼"D. Wt. 7 lbs. Indications The Deluxe Folding Walker with wheels is indicated to assist the patient in ambulation. Goals Increase mobility. Improve quality of life. Ease of use. Lightweight mobility device. If you have any questions about this product by Medtherapies Braces, contact us by completing and submitting the form below. If you are looking for a specif part number, please include it with your message.